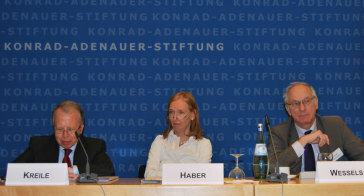 On 18th and 19th October 2012, around 55 experts from academia as well as practitioners and policy makers met at Konrad-Adenauer-Foundation in Berlin to discuss the European Union’s development as a foreign policy actor since the coming into effect of the Lisbon Treaty. The conference was organized by the Institut für Europäische Politik Berlin (IEP) and the Konrad-Adenauer-Foundation, with the support of the Erasmus Academic Network LISBOAN and the Fritz-Thyssen-Foundation. During the two-day workshop the experts from all over Europe as well as from overseas debated developments in the EU’s Common Foreign and Security Policy and assessed current challenges critically.